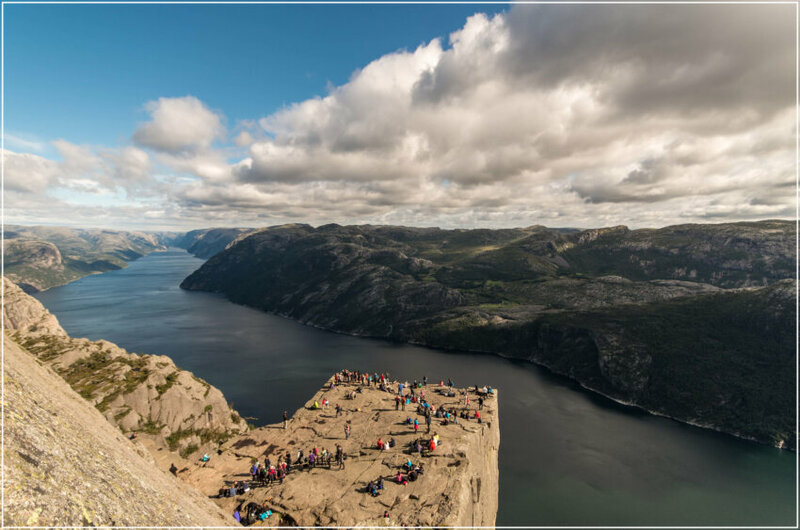 Just 15 miles away from Stavenger, Norway’s fourth largest city, is an exhilarating climb that culminates in one of the world’s most spectacular vistas. 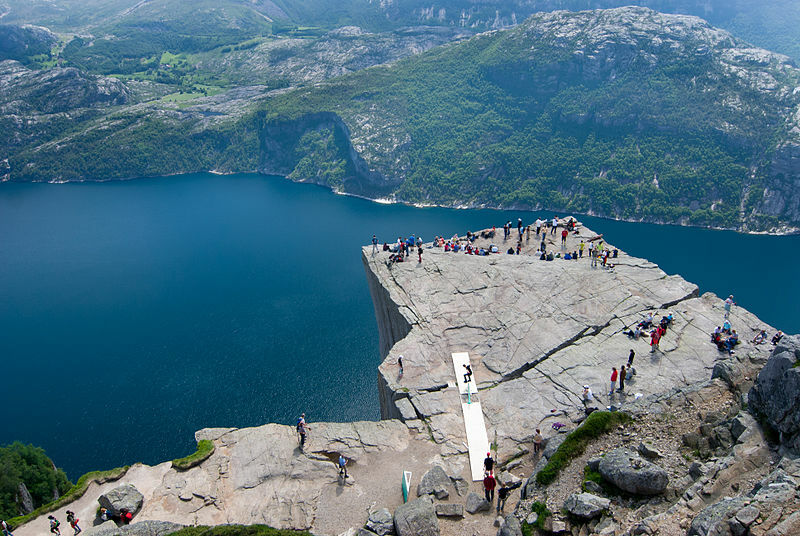 This is Preikestolen, or the Pulpit Rock — a dramatic cliff with a sheer vertical drop of 1,900 feet to the serene blue waters of the fjord below. 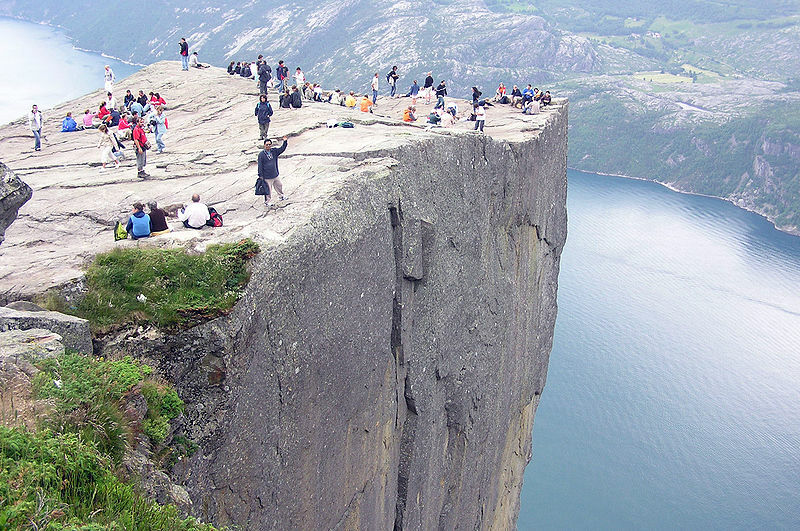 Like the vast Lysefjord below it, the Pulpit Rock was formed by the inexorable power of ice on stone. About 10,000 years ago, the great glaciers of the Ice Age covered the entire region. Water from these glaciers seeped into the small crevices of the mountain, expanding as it froze, and causing huge chunks to break away. What was left as the great glaciers receded was a flat rocky promontory high above the lush valley. 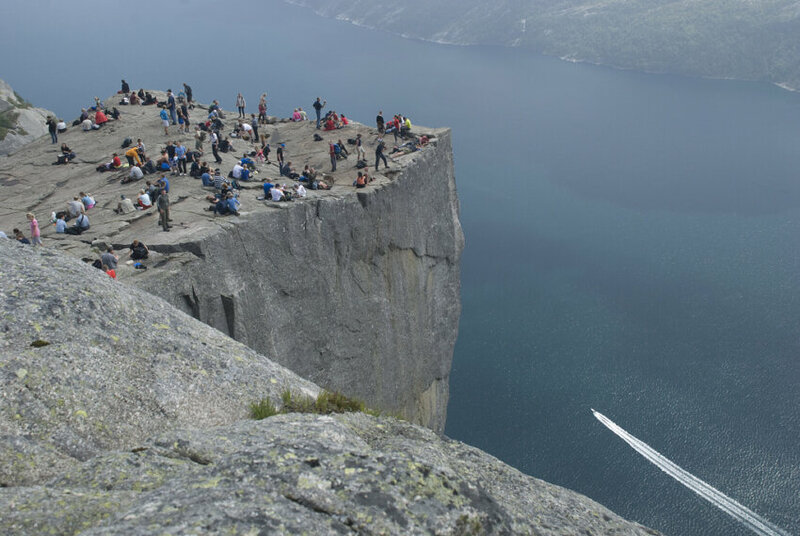 The Preikestolen today is scarred from top to bottom by cracks that someday will cause it to fall — but for now it remains safe enough for casual climbers to enjoy. Hiking from the start of the trail to the top of the cliff and back again takes about 4 or 5 hours. The climb, while not especially treacherous, can be demanding for novice hikers. The trail ascends and drops off frequently, with wooden boards providing a pathway between cliffs. Along the way hikers can enjoy the gorgeous surrounding scenery, the abundant wildlife, several pleasant picnic spots, and even access to swimming in the warmest months. Reaching the summit, trekkers are rewarded by breathtaking views of the fjords, the mountains, and the waterfalls that ribbon the mountainsides. These views are completely unencumbered by fencing of any kind, and many visitors sit or stand right on the edge of the cliff for an experience like no other in the world. 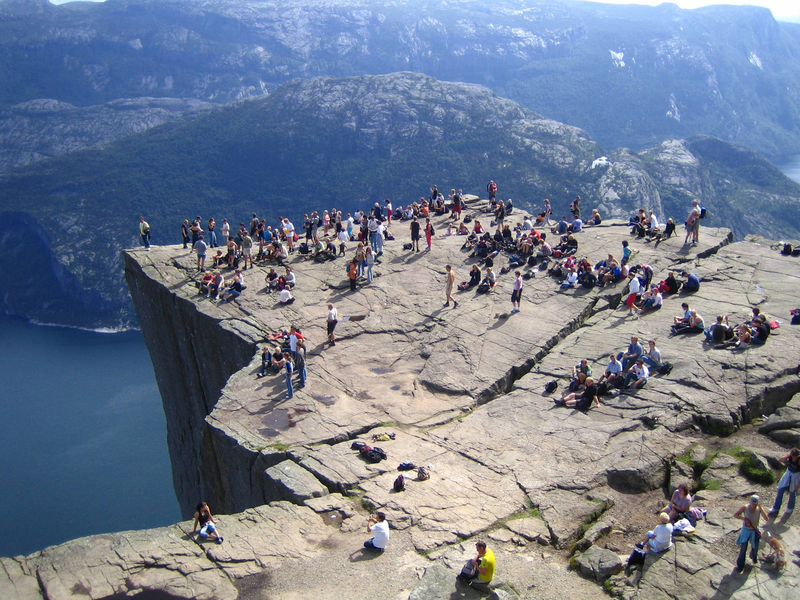 The best time of year to climb the Preikestolen is during Norway’s brief summer, from mid-June through August. 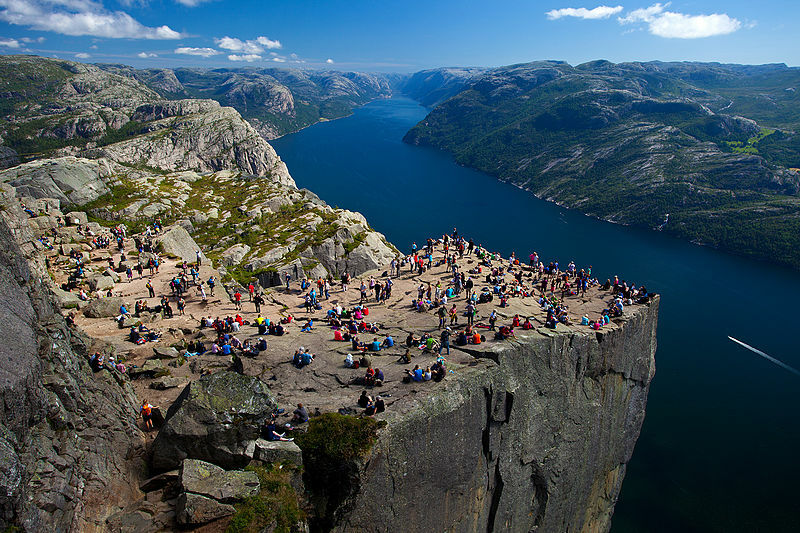 During the summer it’s also possible to tour the fjord by ferry, and explore the region’s other beautiful spots by hiking the Lysefjord’s mountain shores or climbing nearby Kjerag Mountain. 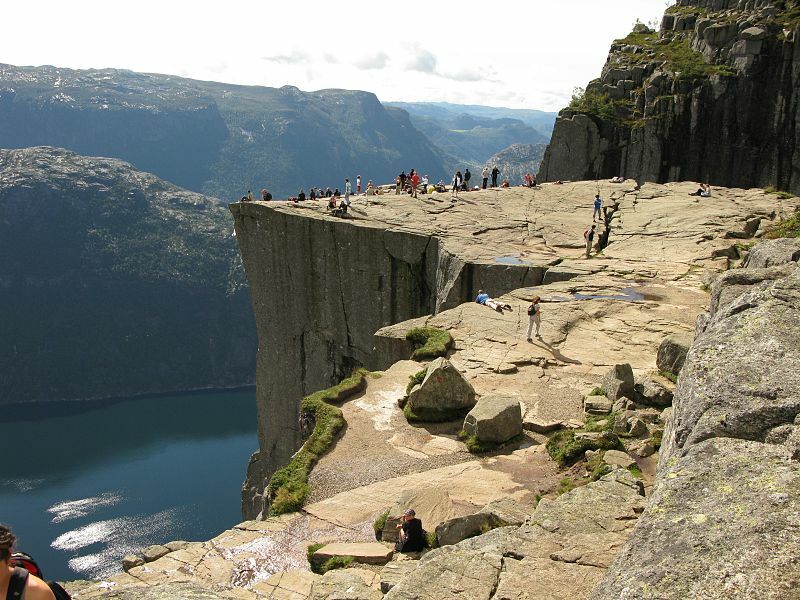 Those wishing to immerse themselves in the beauty and history of this lovely region can stay at the Preikestolen Mountain Lodge, close to the start of several enjoyable hiking trails. The area also features the chance to see prehistoric rock carvings dating back to 500 B.C. and the ruins of Landa, an ancient Norwegian village. The breathtaking scenery of Norway’s fjords is well known throughout the world. 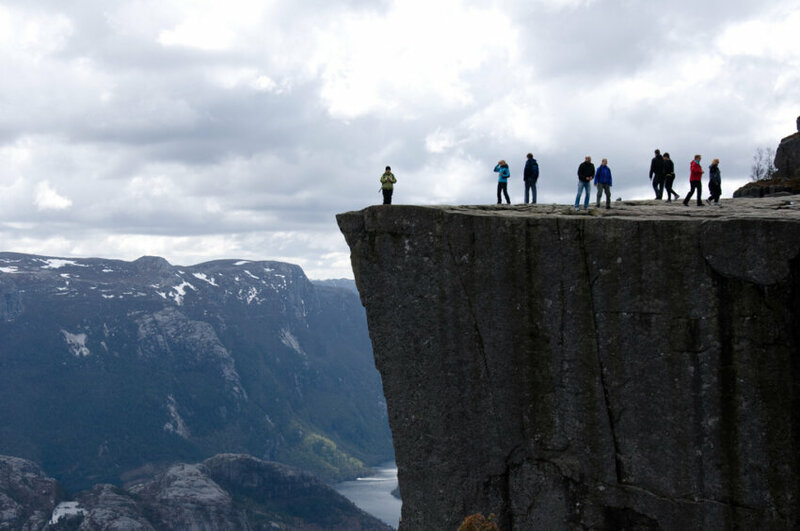 But the opportunity to view them from nearly 2,000 feet above, on the Preikestolen’s jutting windblown plateau — that’s the chance of a lifetime.